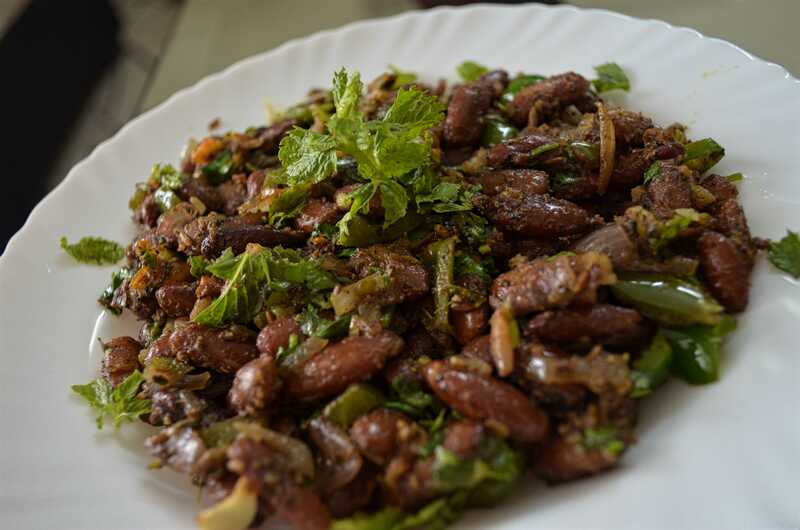 2 cups boiled Rajma - take care not to over cook it, we want it cooked till just soft and not mushy. Heat oil in a pan, add cumin seeds and let it crackle, add chopped ginger and garlic fry for a minute. Add chopped onion and cook it for a minute or just till it turns little soft. Mix in chopped chilies, capsicum n tomatoes and saute for a minute or two. Season with salt, pepper, coriander powder and garam masala powder. Add in rajma, mix well and stir fry it for 4-5 minutes. Sprinkle crushed kasuri methi and lemon juice. Serve hot garnished with coriander and mint leaves.